Please come visit us during class hours to ask questions, observe, or register for your first class– free of charge. Beginners may come in and take any basic class right away on any weekday evening. Visiting aikidoka may join us at any time. Payable by check, cash, VISA or MASTERCARD. Register at our dojo for your first class FREE and receive our introductory rate of just $90 for the first month– $50 off our regular rate. 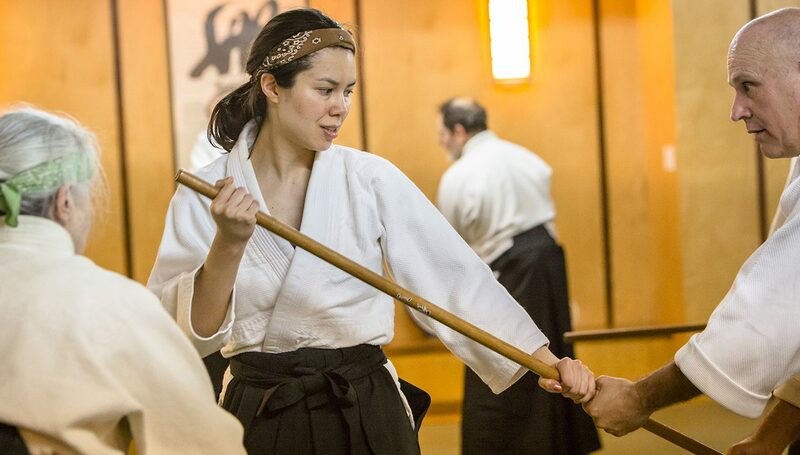 We really value the unique and dedicated students that are part of Shin-Budo Kai. 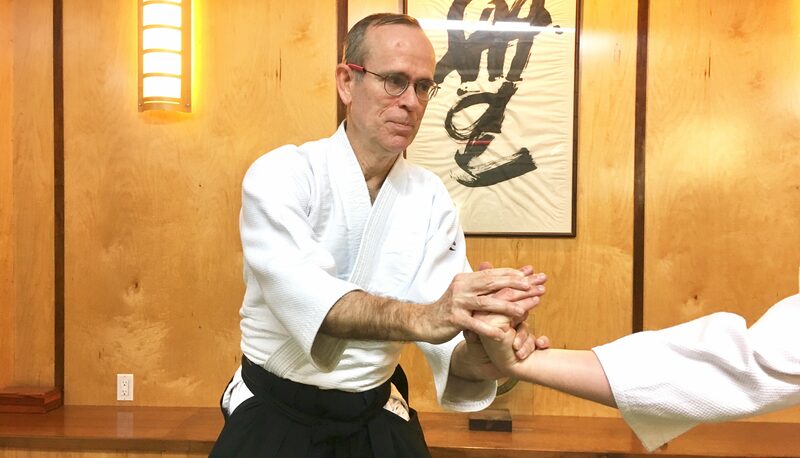 Here is a look at a few of our students, at various levels in their Aikido journey. Dr. Brown applying the kote-kaeshi technique. 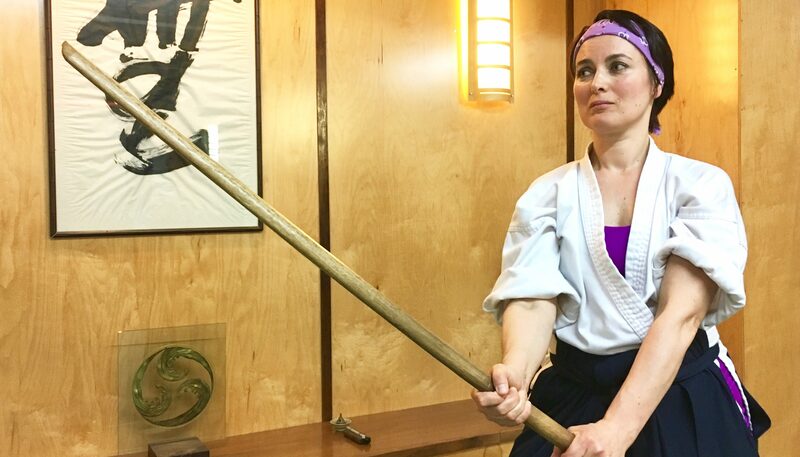 Veronika holding her bokken (wooden sword). When my dancing career began to wind down, I started taking Aikido classes to fill the void. Learning this discipline has been a truly enlightening experience. Also, as a yoga practitioner, Aikido has helped me in the area of balance, focus, and energy flow, not to mention it's a great workout! Lyle modelling our official SBK hoodie. Lyle began his martial arts training with Jeet Kune Do, Street Fighter 2, and the art of watching ninja and kung fu movies. 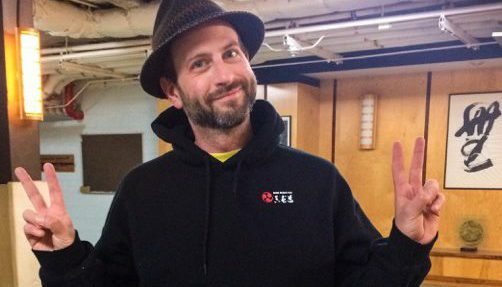 He's a Brooklyn gym teacher and Star Wars guy with a Dungeons and Dragons habit. After training with Shaolin monks, Muay Thai fighters, grapplers and the like, Imaizumi Sensei blew his mind with martial magic. Saki (left) learning Jo-nage from Warren. I was always intrigued by martial arts but never really felt comfortable trying one until I saw Aikido. Other martial arts seemed too aggressive, but Aikido is very strong while using minimal force. I love the emphasis on blending and flowing with your opponent. After practicing for about 5 years, I am still learning every day. It challenges my mind and body and has helped me grow stronger in many different ways. 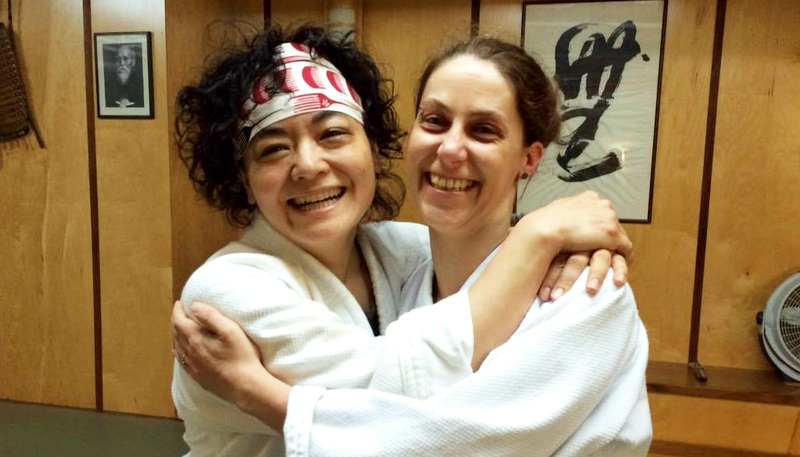 Yuko (left) and Laure celebrating after passing their tests. I started practicing Aikido, the only form of martial art I had ever experienced, at the end of 2014. I was simply looking for something new, active, and challenging, not expecting anything in particular. Then within months, it became a part of my daily life. I still cannot quite articulate what it is about Aikido that keeps me practicing three to four times a week, but every time I get on the mat, it is a new discovery and reflection of self. WORK IN PROGRESS!! 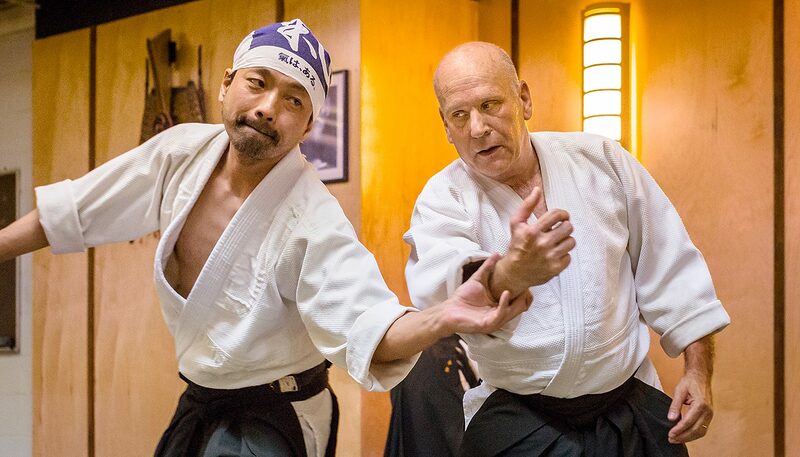 Warren (right) practicing a technique with Shoji. If you would like to start on a life-long journey, this dojo is a good place to begin. If you have already started but find yourself going in the wrong direction, this dojo is a good place to get back on track. If you think you’ve already arrived, this dojo is a good place to remember you have just started and you have a long way to go. Shin-Budo Kai, Inc. is a non-profit educational organization (501c) formed to disseminate the principles of Aikido and Ki. It admits students of any race, color, and national or ethnic origin.